Meeting minutes refers to the notes taken instantly while a meeting is going on. The minutes feature the agenda presented and discussed in the meeting along with the conclusions derived or decisions taken at the meet. Such documents also include the list of attendees. Our ready made meeting minutes templates are available free of cost and relieve you from drafting the whole thing from scratch. You can use it for both personal and commercial purposes, by offering a link back to us. 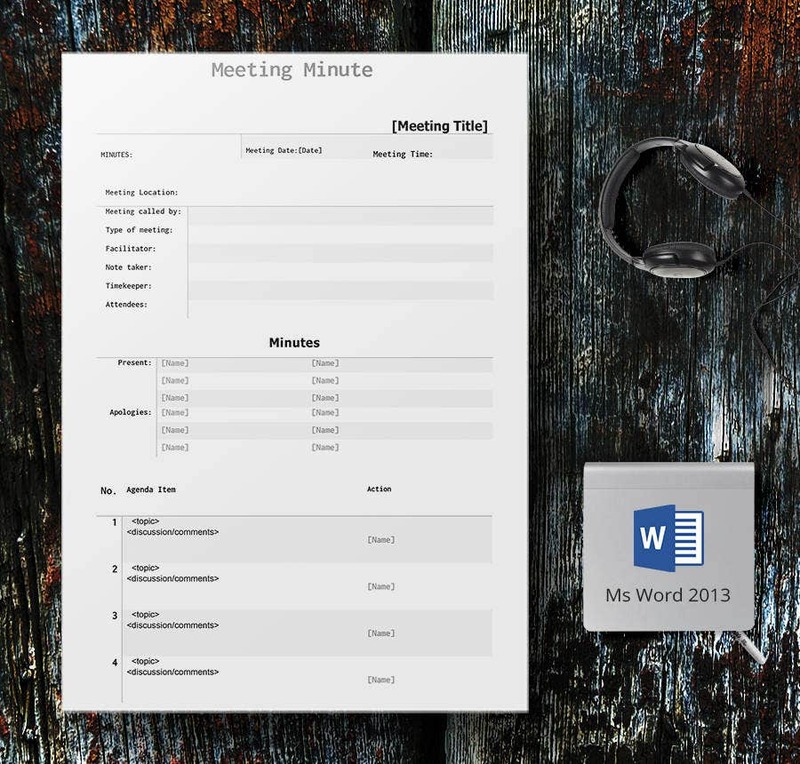 You have a practical meeting minutes template here with all the major sections needed in a minutes document such as attendees, agenda, open actions etc. There is also a section for next meeting details. If you are looking for a simple yet functional meeting minutes template without bells and whistles, this template would work for you with its long section on agenda. You have sizable space for each category and section. 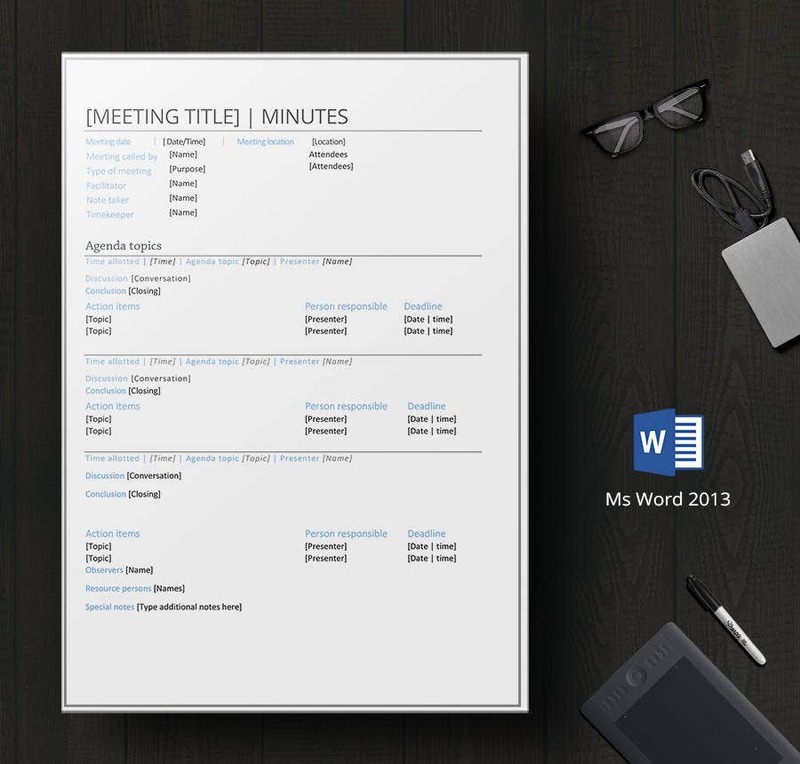 If the meeting is about to include a long list of agenda items, then this template would be a handy option for you with its long agenda roster. It also includes other major aspects of meeting minute like kind of meeting, note taker, facilitator etc. You have a full fledged meeting minutes report template here which shows how a report is formatted from the information gathered from a detailed meeting report- with details on decisions taken and announcements made. 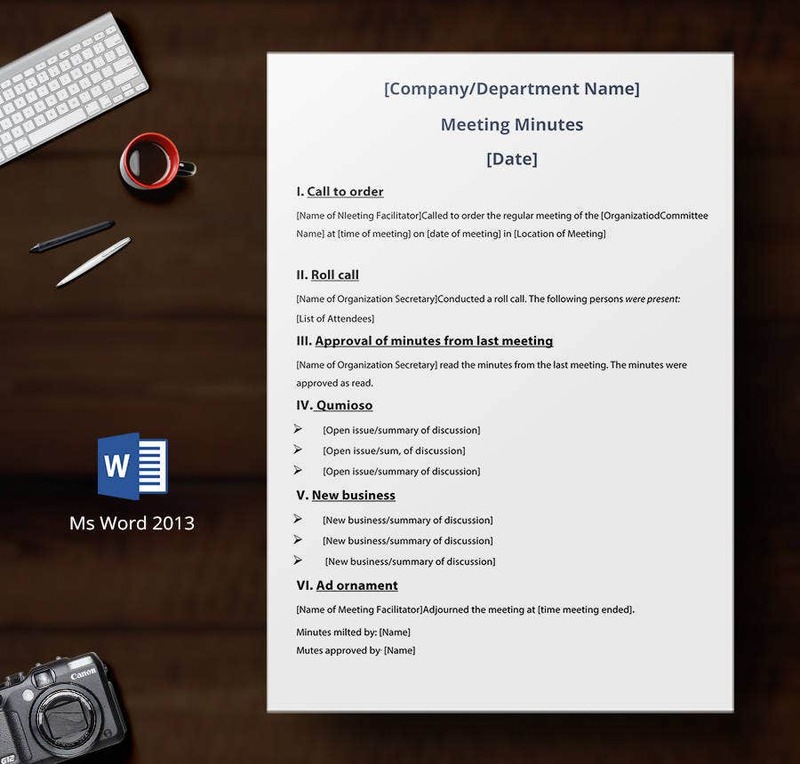 This is a basic meeting minutes template that allows space to include details on up to 4 agenda items discussed in a meeting- with pointers on decision taken, time allotted, and name of the person responsible for it. This is a very sophisticated meeting minutes template which would be suitable for meetings discussing not more than 2 agenda items. You have sizable space to cover all important sections on the agenda like discussion summary, conclusion, person responsible, deadline etc. 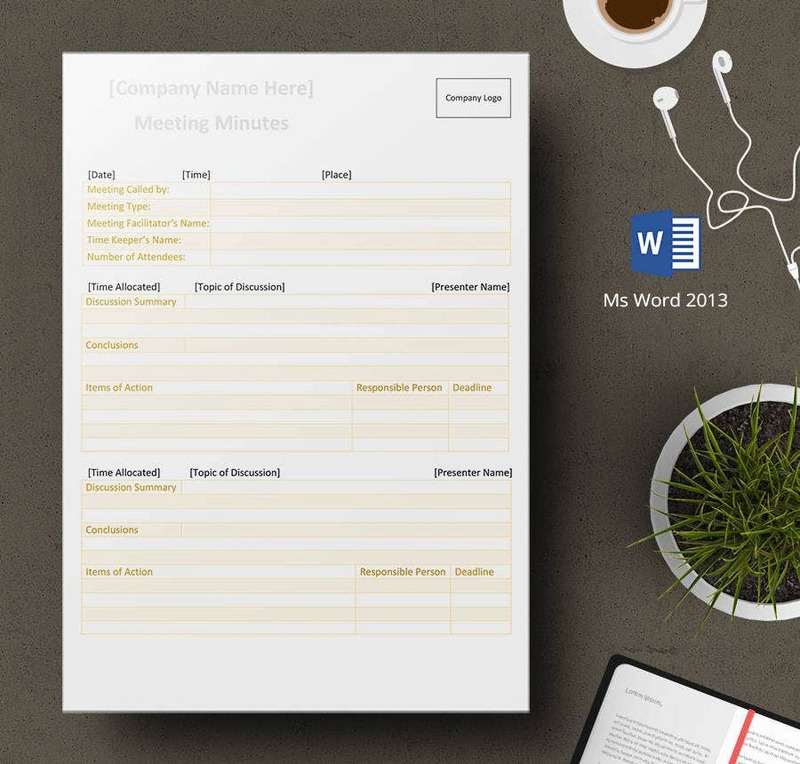 You have a well-defined meeting minutes template here, neatly arranged with all the needed sections such as purpose of meeting, list for attendees, meeting notes, action items, and even next meeting.. 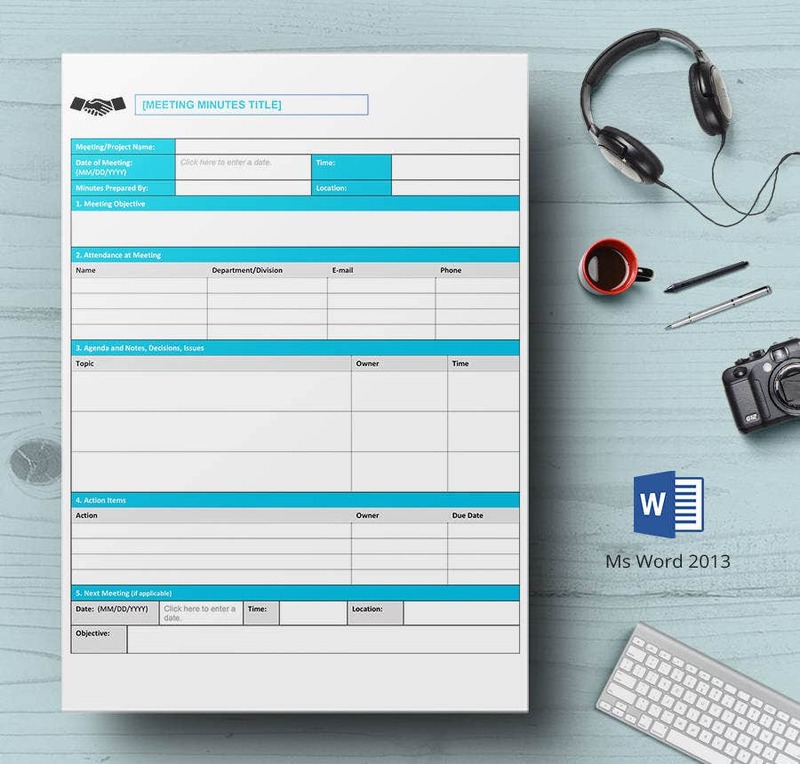 If you are looking for ideas on how to write meeting minutes, this template would be a great deal for you with its briefs on what to write under each of the sections of a meeting minutes. 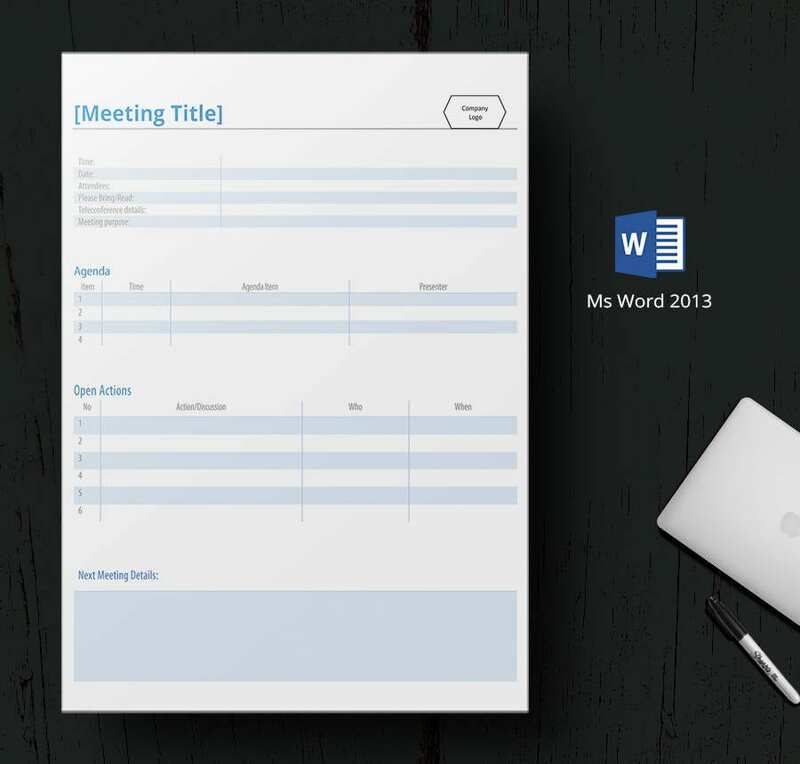 You have a neat and smart meeting minutes template here in soothing blue & white combo that includes all major aspects of such a document like attendees’ list with department, agenda, action items and next meeting. 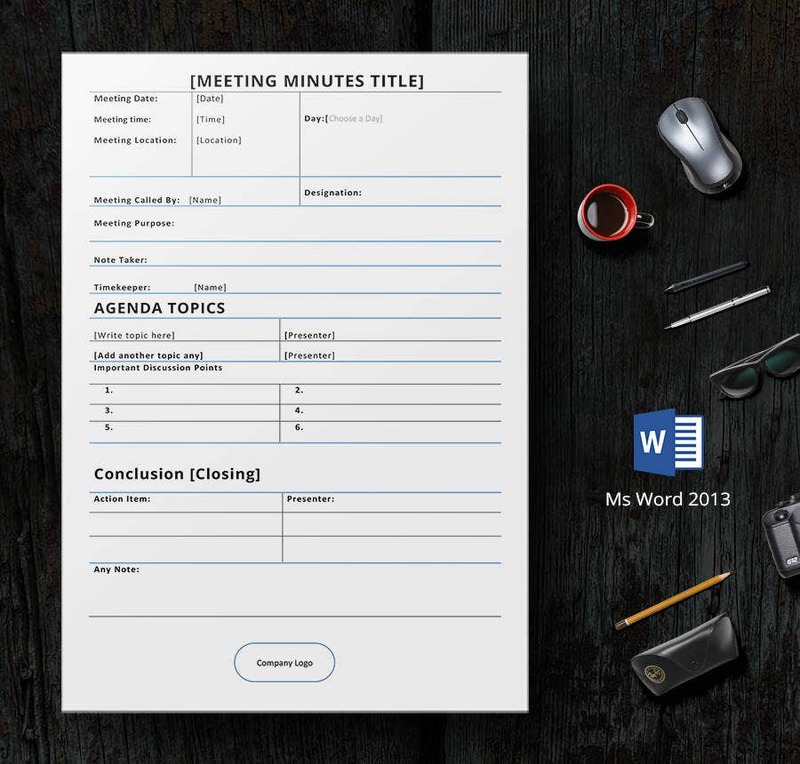 This meeting minutes template would allow you to note details about as many as 6 agenda items and the concluding part closes neatly with the basics like action item, presenters name -and a concise area for notes. 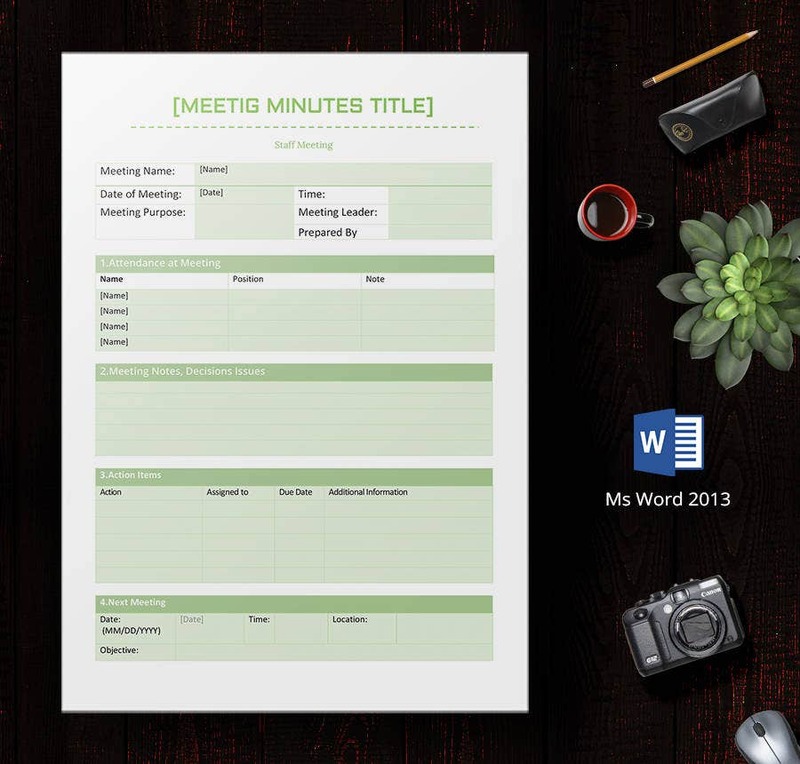 If you are looking for a minimalist meeting minutes template that features no exaggeration yet does not lose out on basic fundamentals of a basic minutes document, this serene green & white template would be perfect. 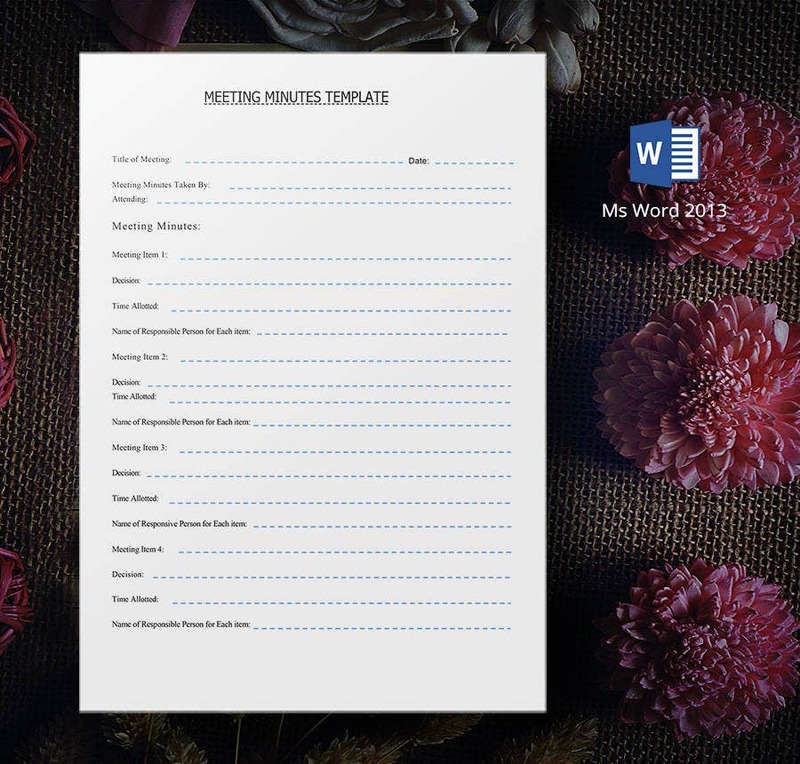 This smart meeting minutes template here will allow you to document for up to 6 agenda items in a meeting. You have space to write about both discussion & conclusion of each action item and there is also a separate area for special notes. Unlike other regular meeting minutes, this template is little different as it includes a separate section for apologies. You can include up to 4 agenda points here. The alternatively colored spaces help with easy differentiation of information- despite no well-defined line. > How to use Meeting Minutes Templates? 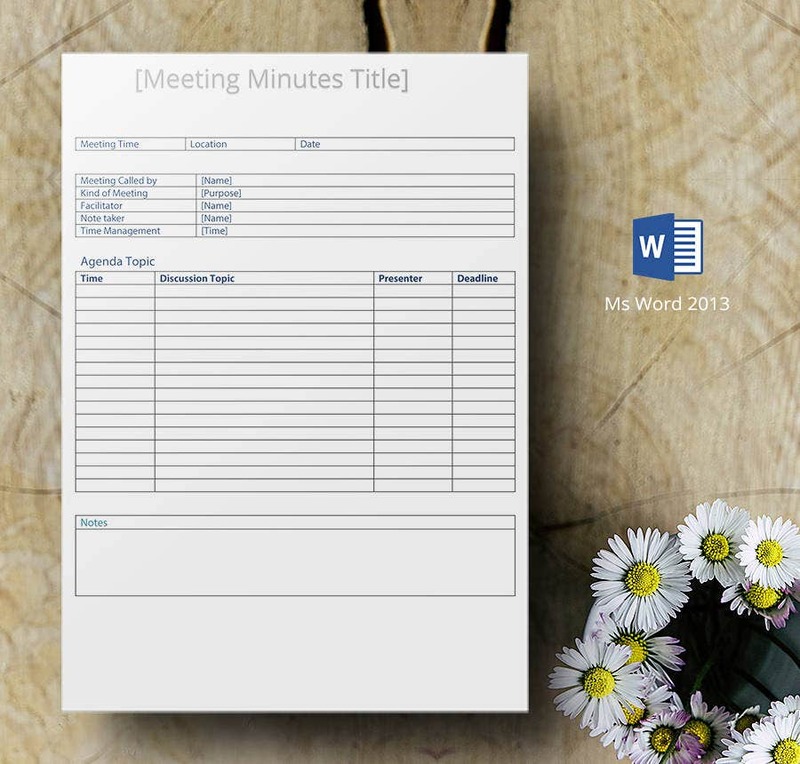 Meeting minutes template is much needed when you have to jot down the main details of a meeting instantly. You have to include the primary data of the meeting such as time, date, location, name of meeting facilitator, and note taker. Then, you will write the summary on the actions taken or decisions made for each agendum. 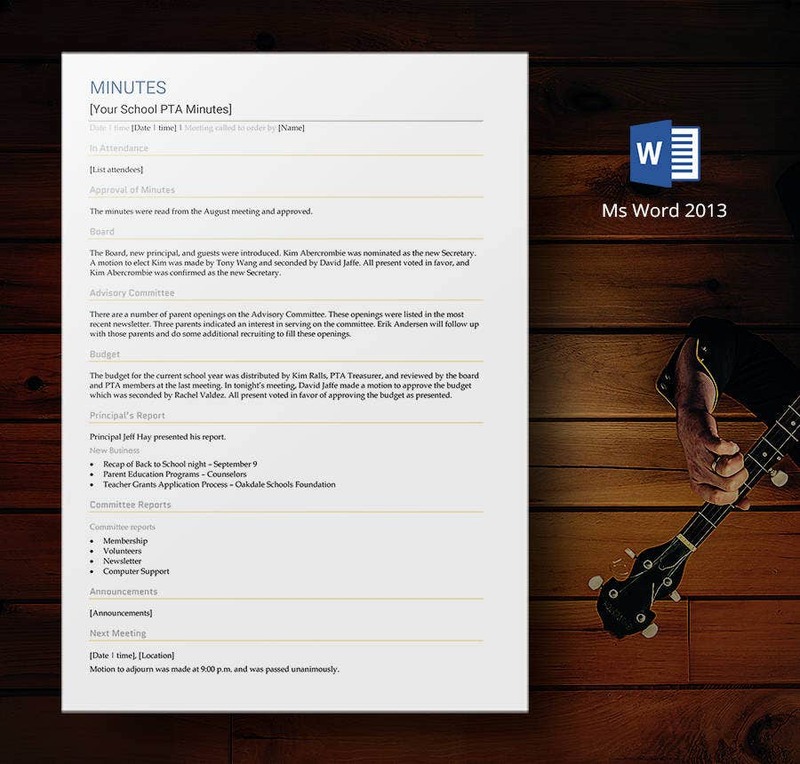 Besides, you will use the meeting minutes template to document about the list of attendees in the event as well. Some of the templates would even ask you to write down the basics of the next meeting, if any. 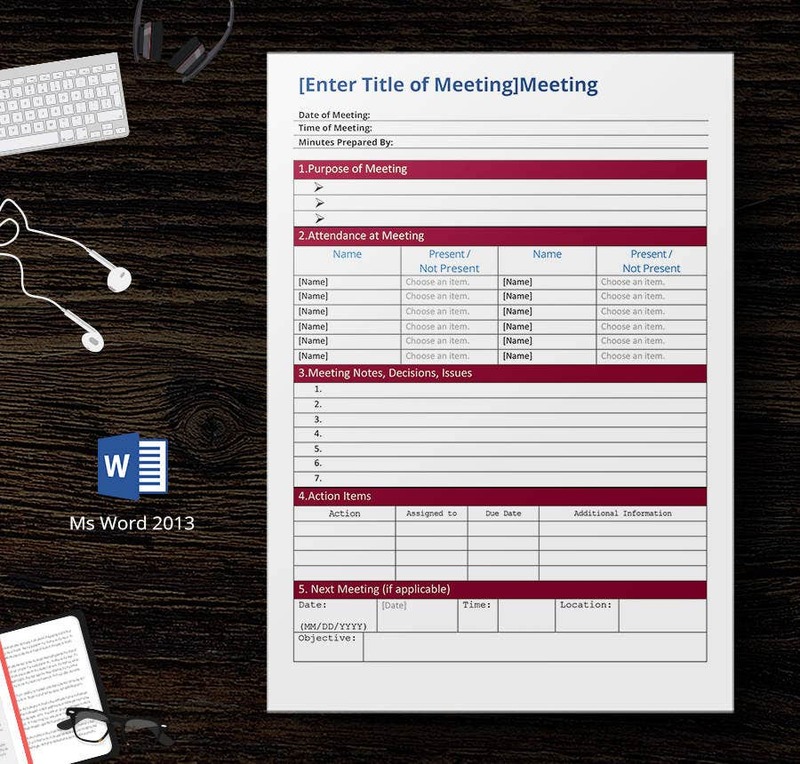 It’s easy to use our meeting minutes templates. All you have to do is to download the template, print it out and then customize with your own data. 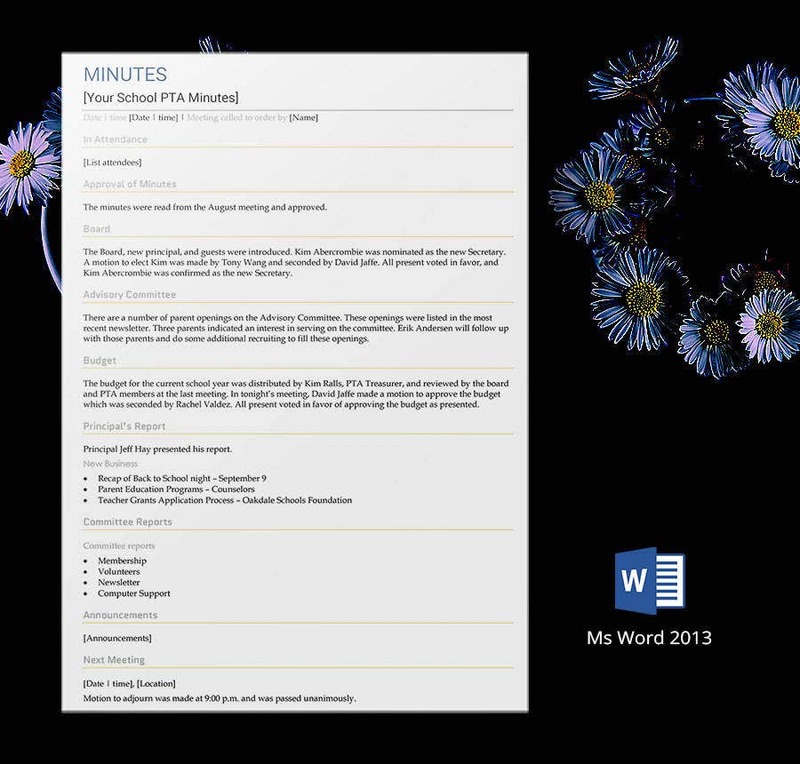 > What are the benefits of Meeting Minutes Templates? Most of the States have made it mandatory for C & S Corporations to keep a document of the major decisions taken in business meetings. Thus, maintaining a meeting minutes template ensures that your actions are in full compliance with the State regulations. Then, such documents offer a proper organized structure to the agenda and action items discussed in the meeting by presenting everything in written format. This way, you don’t have to worry even if you forget anything important discussed in the meeting. Besides, such templates help you to map out the next move by your company by offering the strategies discussed right on your fingertips.